Bottom of the 9th includes tons of variable player powers, myriad customizable line-ups, and rules for advanced league and solo play to keep gamers wanting to play ball time and time again. Ahhh, baseball parks. The smell of cut grass, hot dogs and that sweaty guy sitting next to you. I love baseball. As relaxing as it can be to watch a game, it also produces some of the most dramatic moments, especially when teams are tied at the bottom of the 9th. This game skips the opening of the game and boils it all down to those last 3 outs. A team with only 2 pitchers left is going up against a team of 6 remaining batters to decide the outcome of the game. If the home team doesn’t score, the away team will win by default because they are an offensive juggernaut. This is the home team’s last chance! Decide who wants to be home/away. You can either randomly select or purposefully draft your players. 2 Pitchers for away, 6 batters for the home team. Batters have 1 limitation: each hitter is a position player and you can’t have more than 1 type of position (ex: you can’t have 2 first basemen). Each batter and pitcher are unique with varying strengths and weaknesses. Each also have special abilities and some have ongoing effects. Batters set up a batting order, pitcher selects starting closer, and then you start! During the stare-down, both batter and pitcher use their “pitch tokens”. The pitcher is secretly choosing either low/high and inside/away for their pitch, the batter is secretly trying to guess what pitch the pitcher is going to throw. The pitcher has an “ace” pitch that he can throw that can make it hard for the batter to hit. However, the pitcher will become fatigued if he throws the elements of that pitch too often. (If an ace pitch is “low and inside” having someone throw “low” a lot will fatigue the pitcher). Once a pitcher is fully fatigued he can’t throw that type of pitch, so the batter will guess that element correctly (since he only has 1 choice). Both pitcher and batter reveal their tokens, if the batter guess some correctly, he gains batting powers or a combination of possible powers. If the batter misses the pitcher gains powers or a combination of possible powers. Next is the batting phase. The pitcher rolls 2 dice. One is for pitch control (normal 6 sided die) the other pitch location (dice with 3 Bs, 2 Ss, and a C). The pitcher could throw a “Ball” a “Strike” or a “Corner” pitch. Each pitch has it’s strengths and weaknesses. The pitcher then applies any powers including re-rolling dice or adding on to the total, among many other different abilities. The batter then rolls 1 dice and applies any powers, like the pitcher. You check the batting chart to see if you have a ball, strike, foul, or a hit. If you get a hit, now you have to make a mad dash down the baseline! You and the pitcher engage in a roll-off (variant included which takes out the speed element, I prefer that way). Batter rolls a 5-6 first, then the hitter is safe. The pitcher rolls a 5-6 first, then batter is out. Additionally, if the batter rolls a natural “6” on a Strike pitch, the ball is “crushed” and the player has the opportunity to get a home run, double, etc. If the ball is possibly going to be a home run, the fielding team has 1 chance to scale the wall and catch the ball by rolling a “6”. After settling the outcome of base running, or a 3rd strike/4th ball the next batter goes up and the game starts over until a run is scored or the 3rd out is recorded. I collected baseball cards as a kid and was immediately reeled in by the character cards, and the sticks of gum. There’s just a lot here for lovers of baseball, the theme is solid in this game. People who don’t like baseball will probably not take to it as quickly. Most of the rules are intuitive… if you know baseball. If not, then it will take more time to understand. This will hurt their initial enjoyment. Additionally, if they don’t get into the theme, it could feel like a roll and check type of game, which is less fun. Since it has a few light decision making, it is important to have a fast stare down, batting phase, and base running phase. If the game moves quickly, that makes for a fun game. Early on, the game will take a few extra minutes, which hurts the fun of the game. If you take 5 minutes on 1 pitch and it ends up getting fouled off, or it’s a ball, that’s annoying. You want action! If the whole batting phase takes 1 minute, then you probably feel like you “just missed it!” and are excited for the next stare down. I recommend this to baseball fans who don’t mind dice. This game would be great to bring on trips or to a bar, since it comes in a small box (as long as the lid stays on…). My wife will play this game with me, but she’s not crazy about it. I have some friends who just LOVE building the line-up for the batters and could honestly spend all day just doing that. All in all, it’s a fun, light, fast game with the right people. One of my favorite light, fast games to play. It’s simply a dice-rolling game, but w/ a great old-school baseball theme behind it. It even has some speed rolling components as you have a dice roll race to see if a batter gets on base. The Staredown (bluffing aspect) is fun. Although it just includes 2 aspects to bluff, it is both fun to literally stare down your opponent and adds some risk/reward value as the Pitcher may lose some stamina (his ability to throw his signature pitch) if he chooses his signature pitch during the Staredown. However, losing stamina isn’t too game-breaking as I’ve lost as a Batter to a Pitcher who had basically 0 Stamina for the last 2 outs. Each Batter and Pitcher has their own abilities, based on their successful Staredown results, as well as some having passive abilities that are always in play (such as having bonuses against Left- or Right-handers). This adds to the replay value, which is already high as the game is a great 5~15 minute filler game with some fun dice-rolling to be had. The rules are easy to learn, pretty much everything is covered in the book (I think the only vague thing is if Batters always get the Staredown bonus if a Pitcher runs out of stamina for a respective location token), but I always play to give the Batter the automatic bonus if a Pitcher is at 0 Stamina. Also, I don’t believe it says if baserunners advance 2 bases on a double, but I presume since it doesn’t say that, then they do not. The one thing I have trouble memorizing is the contact/strike/ball chart based on what dice your Pitcher rolls. But that’s just me and my bad memory! The components are great. The wood tokens and meeples are standard-to-high quality. The dice are sleek and the cards are reminiscent of old school baseball cards. The style of the cards are nice and nostalgic and easy to read and understand. This is a fun little title from a company I had no previous experience with. I took a chance on it and I am very glad I did. The components in the box are all good quality. I liked the vintage feel with the colors and all. Someone at Dice Hate Me also plays games, and I enjoyed seeing the boardgame genre well represented well on the baseball player cards. There is a lot of game for such a small box. In a world filled with cheap filler material and more being pumped out daily on kickstarter, it is nice to see a good quality game. There is an engaging solo aspect to the game as well. This is nice for scratching the gamer itch when your normal group is unavailable. 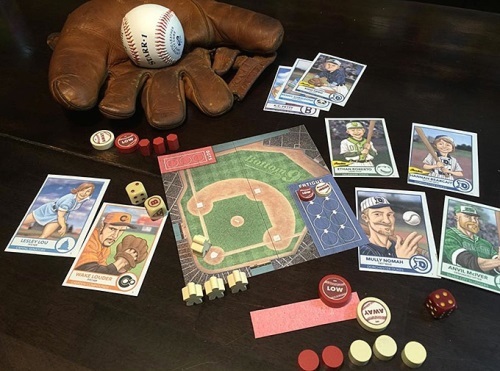 During the course of the game, there are multiple mechanics that all seem to flow well together and at times (like with the runner dice roll off) capture the excitement of a real ballpark. There are some expansions available, but have no experience with them. My only gripe is that I can see how the batting line up can become a little redundant as the abilities of each batter are generally the same with the exception of their special ability. Overall, I would say that it is a great experience that even my wife (not a gamer) enjoys. Who is on first? Bottom of the Ninth. But it isn’t number one. It should be a small easy game but the rules seem quite complicated about the pitcher moving the thing and the batter trying to guess what the ball is by guessing with the two disks. All the cards have special powers to remember so don’t be sleepy. The pieces are wood except for the cards and that is nice and the cards look like baseball cards and the one thing looks like a piece of gum. Don’t eat that it will taste like cardboard. Add a Review for "Bottom of the 9th"